Traveling for work? Book the Business Class Room for upgrades like a free breakfast each morning and a free drink voucher in the evening. These rooms also include an in-room safe, a microwave and a refrigerator. Whether it’s breakfast at 6 a.m. or dinner with colleagues, enjoy your next meal on site at Main Street Café. Our casual on-site eatery has delicious American classics to satisfy any craving. Amp up your night when you stop by Cassidy’s nightclub and dance to the DJ’s mixes Wednesday, Friday and Saturday. Hotel guests and locals alike flock to Cassidy’s for some of the area’s best after-hours parties. To sip a drink while you watch the game, visit the Lobby Bar. Drop in early on weeknights for Happy Hour deals, or head to your room for a quiet night and a delicious meal from the room service menu. Billy Bob’s Texas – Dubbed “The World’s Largest Honky Tonk,” Billy Bob’s has repeatedly been named country music club of the year and has welcomed more than 17 million visitors. Enjoy line dancing, two-step lessons and live concerts, or watch professional bull riding competitions in the indoor arena, all about 10 minutes from the hotel. Fort Worth Stockyards National Historic District – Located about four miles from the hotel, this historic district is a great place to celebrate the romance and mystique of the American West. You can take in a thrilling rodeo, see the world’s only twice-daily cattle drive or sip on a cold brew in an authentic saloon. Texas Motor Speedway – Enjoy the excitement and fulfill your need for speed at Texas Motor Speedway. Attend special events, enjoy a VIP Experience, or sit in the stands for thrilling NASCAR, IndyCar and Sprint Cup races. 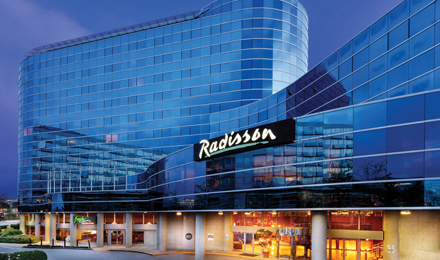 Whether you need a ballroom for a 100-person banquet or a conference center for 1,000, you’ll find it and more at the Radisson. We offer 12 meeting rooms with a total of 12,000 square feet of event space, plus excellent catering services that are sure to please any crowd. Recharge in your room with free Wi-FiAfter a day of exploring the Stockyards or other local attractions, retreat to one of the 247 newly renovated rooms and suites at the Radisson in Fort Worth, TX. Take your time enjoying the hot water in the granite shower before settling in to watch ESPN or HBO on the television. In the morning, make yourself a hot cup of coffee from the in-room coffeemaker, or order room service and indulge in breakfast in bed. In addition to all standard amenities, many of our Standard Guest Rooms feature a sleeper loveseat or oversized reading chair. Take it easy in this large suite that features a private bedroom and a separate living area. The oversized jetted tub is a great place to wind down before bed. For corporate rates and group discounts, please call +1 (817) 625-9911 and select the option for group sales. Stay on site for Cassidy’s and Main Street CaféFrom casual breakfasts at our lobby café to late-night drinks and dancing at our nightclub, Radisson Hotel Fort Worth North-Fossil Creek offers you a variety of outstanding restaurants and bars. Enjoy fresh, contemporary meals at Main Street Café throughout the day, and then plan a special evening out at the upscale Cassidy’s nightclub. We also offer the smoke-free Lobby Bar for a more casual evening of drinks. Prefer to dine in your pajamas? Place an order from our room service menu. Located adjacent to the hotel lobby, Main Street Café offers a relaxed atmosphere and an à la carte menu for breakfast, lunch and dinner. Put on your dancing shoes and head to Cassidy’s, the Radisson hotel’s on-site nightclub that’s been named a “Place to Be” by Dallas Morning News. Start with Happy Hour specials from 5 to 7 p.m., and stick around for live entertainment from our DJ. Dress is smart-casual. Relax in our smoke-free Lobby Bar, offering comfortable seating, two flat-screen TVs and a casual atmosphere. Don’t miss the weekday Happy Hour specials, with half-price menu items and drink discounts from 5 to 7 p.m. Prefer a private meal in the comfort of your own room or suite? Order in with the convenience of room service. Daily, 6 a.m.-2 p.m. and 4-10 p.m.
Mon, Tue and Thu, 4-11 p.m. Wed and Fri, 4 p.m.-1:30 a.m.